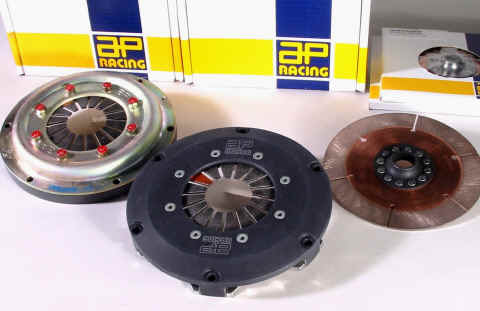 For many years AP Racing has been a world leader in the design and manufacture of competition clutch systems. And although they manufacture five other diameters (115mm, 127mm, 140mm, 200mm, 215mm) in cerametallic or sintered drive disks, the following information is about their most popular and historically copied, 184mm (7-1/4") sintered disk assembly. In our opinion, for single disc clutch users wanting long term worry free usage, the smaller 140mm (5.5") which some engine builders want you to buy, will not hold up (no mater the manufacture) as well as the 184mm assembly. Left A-Ring Type, Center Lug Type, Right Sintered Disc. Push type release - The most popular type of diaphragm spring clutch where the release bearing is pushed against the diaphragm spring fingers (i.e. towards the flywheel) to release the clutch. A thin layer of metallic friction material which is sintered directly onto a steel disc. Upgrade your ******* brand, single disc 184mm clutch, with the proven performance of an AP Racing clutch assembly and sintered driven disc. Regular inspection and maintenance is essential to maintain optimum clutch performance. Excessive heat generation (often witnessed by discoloration of steel pressure plates) due to prolonged or repeated slip can result in loss of diaphragm spring load as well as driven plate damage. In such cases the clutch should be replaced. Pressure plate working faces should be checked for flatness using a straight edge and feeler gauge. 'Out of flat" pressure plates or driven plates can result in difficulties releasing the clutch and consequently drag. Pressure plates should be replaced when worn, or more than 0.10mm (0.004") out of flat. Replace driven plates if there are signs of damage or when thickness has been reduced to the figures given for each individual clutch. For other AP Racing clutches or sub assemblies, contact our sales department for assistance.